Over on the main page Dennis has a nice announcement about an upcoming webinar on the future of fee shifting post-Octane. Two thoughts. To make sure Section 285 is implemented with appropriate vigor, judges must look more closely for signs that a patent lawsuit was pursued primarily to take improper advantage of a defendant — that is, using the threat of litigation cost, rather than the merits of a claim, to bully a defendant into settling. I am looking forward to the upcoming CLE-webinar by my former MBHB colleague Andrew Williams, Ph.D. along with Erin Woelker on the impact of the Supreme Court’s fee shifting cases. There is no fee but you must pre-register here: http://tinyurl.com/ljw5odg. [Tuesday, June 10, 2014 10:00 am (Chicago Time)]. More dramatic Fee-Shifting legislation is still pending in the Senate. However, each day’s delay makes its passage less likely as we move into election season. Note – this decision by the Federal Circuit was released prior to the Supreme Court’s recent decisions in Octane Fitness and Highmark. Cartner sued the road-maintenance equipment maker Alamo back in 2007 alleging infringement of his U.S. Patent No. 5,197,284. The patent covers a particular design for a hydraulic motor deceleration system. In 2010, Cartner gave-up its case and agreed to a consent decree of non-infringement. Apparently, however, the agreement between the parties said nothing about attorney fees – and Alamo subsequently asked the court to award its reasonable fees and costs under 35 U.S.C. § 285. Section 285 gives district courts power to “award reasonable attorney fees to the prevailing party”, but only in “exceptional cases.” Although the Supreme Court recently decided two cases in this area, the fundamental law discussed above is unchanged. The change proffered by the Supreme Court is to shift power from the Federal Circuit to the District Courts who now can make the exceptional case determination and resulting fee award according to their own discretion. Prevailing party? : You might ask – If there is a settlement, how can there be a prevailing party? Here, the problem is that there is not only a settlement, but a “consent decree” – i.e., a judgment on the merits (non-infringement) by the court that results in Cartner losing the case. The district court correctly concluded it was objectively unreasonable for Cartner to argue the Tiger mower could meet the “without a loss of fluid” limitation when that limitation was added to distinguish a system that was, in relevant part, the same as the Tiger mower. The district court also found that the plaintiff had committed litigation misconduct by failing to be forthright in its interrogatory responses and by failing to affirmatively update those responses as the case developed. Holding: $350,000 attorney fee award stands. Under the new regime of discretion-in-granting-attorney-fees, a losing party who has applied a hardball litigation strategy may be at risk. In Octane Fitness, the Supreme Court gave discretion to district courts in determining whether to award attorney fees to the prevailing party. The court also lowered the bar for such a finding – both by removing the somewhat rigid limitations that had been imposed by the Federal Circuit and by rejecting the notion that clear and convincing evidence is a prerequisite foundation for such an award. However, the decision will likely be seen as making an incremental change rather than being a watershed moment. The law remains that attorney fees should only be awarded in exceptional cases that involve misconduct or extreme behavior. Our long tradition in the US had avoided attorney fees except in rare cases and I do not see this court changing that tradition in any dramatic way. The point here is that even the new lower standards are a far cry from the presumptive award of attorney fees as have been proposed in Congress. Enter Congress: Earlier this session, the House of Representatives passed H.R. 3309 (the Innovation Act) with broad bipartisan support. The bill includes a fee shifting provision that creates a presumption that fees will be awarded to the prevailing party unless the district court finds that the losing party’s position was “reasonably justified in law and fact or that special circumstances make an award unjust.” A parallel Senate proposal steps back slightly from the House version and would require a finding that the non-prevailing party’s conduct or position was objectively unreasonable. The legislative proposals also have the creative element of helping ensure that the rule cannot be skirted by underfunding the patent enforcement entity. Rather, the proposal would allow for limited veil piercing in order to collect any attorney fees owed from investors and others with interests in the litigation. One bottom line is that the proposed statutory changes would still push the law well beyond its (newly) current state. As such, I suspect that the push to include these provisions as key elements of patent reform will continue. Despite his support for gun control laws, President Obama has been a major driver of American gun sales. The theory is that folks have been buying guns them now before the President limits their sale. A similar rush appears to have been going on in patent litigation. In particular, an informally proposed amendment to the Senate patent reform bill distributed last weekend includes a clause for retroactive application – naming April 24 as the effective date of the attorney fee shifting provisions, regardless of when the bill becomes law. (c) RETROACTIVITY – the amendments made by this subsection shall take effect on April 24, 2014, and shall also apply to any action for which a complaint is filed on or after that effective date. The result: an unusually large number of infringement lawsuits were filed on April 23, 2014 to ensure that the new law will not be applicable. In particular, about 180 new infringement lawsuits were filed on the 23rd, more than five times the daily average. I wonder how those defendants like patent reform? Others have pointed this out in the past, but today’s NYTimes editorial on fee shifting is fairly low in truthiness. Today’s major debate in the Senate is whether judges should be given discretion in the choice of whether to award attorney fees at the conclusion of patent litigation. The basic idea is that the threat of fee shifting will discourage a party from filing a claim or defense that has only a low chance of winning. That idea makes sense, but it turns out that the actual impact of fee shifting is not well understood – especially if it is balanced (awarded to prevailing party, regardless of whether that is plaintiff or defendant) and if done on a case-by-case (entire lawsuit) basis rather than claim-by-claim. In essence, the fee shifting substantially increases the litigation-stakes – in the end, this may well favor plaintiffs so long as they can engineer a financing structure to manage the risk and essentially take advantage of typical risk adversity of accused infringers. The debate over attorney fee shifting continues both in Congress and in cases before the Supreme Court. In an interesting new article, Saurabh Vishnubhakat compiles fee award statistics for the past decade. 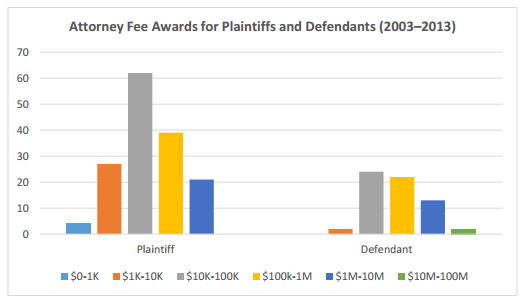 The study reports that prevailing plaintiffs are more likely to receive a fee award, but that the median award of prevailing defendants is much higher. Mark Liang & Brian Berliner, Fee Shifting in Patent Litigation, 18 VA. J.L. & TECH. 59 (2013). James Bessen & Michael J. Meurer, The Private Costs of Patent Litigation, 9 J.L. ECON. & POL’Y 59 (2012). Today, the Supreme Court heard oral arguments in the paired fee-shifting cases of Octane Fitness and Highmark that focus on the proper standard for an exceptional case finding by a district court under 35 U.S.C. § 285 and the proper standard of review on appeal. In Octane Fitness, petitioner asks the Court to lower the standard for proving an exceptional case. In Highmark, petitioner asks for deference to lower court exceptional case findings. In both cases, the Federal Circuit sided with the patentees who lost their infringement actions. In Octane Fitness, the Federal Circuit confirmed that the case was not “exceptional” while in Highmark, a divided Federal Circuit reversed an exceptional case finding based upon a de novo appellate review that gave no deference to the district court’s finding that the lawsuit was objectively baseless. In the U.S., each party to litigation ordinarily pays its own attorney fees regardless of the case outcome. In the patent litigation context, this changes as 35 U.S.C. § 285 provides an avenue for awarding “reasonable attorney fees to the prevailing party” in “exceptional cases” at the discretion of the lower court. However, discretion only goes so far, and the Federal Circuit’s standard for classifying an “exceptional case” has been critiqued as too rigid, tough, and pro-patentee. JUSTICE SCALIA: Mr. Telscher, it occurs to me that you really cannot answer the question of what adjectives should be attached to “meritless.” And the reason you can’t is, since it is a totality of the circumstances test, that is only one factor and it doesn’t have to be an absolute degree of meritlessness. Even in a I assume you would say that even in a very close case, if there has been outrageous litigation abuse by the other side, the court would be able to say: My goodness, I’ve never seen lawyers behave like this. You’re going to pay the attorneys’ fees for the other side. Couldn’t the court do that? MR. TELSCHER: That’s absolutely correct, your Honor. JUSTICE SCALIA: So then how can we possibly define “meritless”? We can’t, because it goes up and down, even in a case where it’s a close case. It could still be exceptional. MR. TELSCHER: It’s the degree of the unreasonable nature of the case as one factor. In a colloquy with Justice Kagan, Octane identified what it sees as a non-exhaustive list of factors to be considered, including (1) whether the case is meritless; (2) bad faith; (3) litigation misconduct; (4) other equitable considerations; (5) anything else that “bears on the gross injustice and uncommon nature of the case.” In addition, Octane argued that the fact that the patentee “never made a product under [the] patent” should be considered as well. Arguing for the U.S. Government, Roman Martinez added that advancement of “objectively unreasonable legal arguments” should also be considered as a factor and, in its own, sufficient for a finding of exceptional case. In his summary, Mr. Telscher did a nice job of summing this up as saying that the exceptional case question is really about “how extreme” the conduct needs to be before it is considered exceptional. One difficulty is that the Justices had difficulty squaring this laundry list of potentially sufficient factors with the legislative history that the statute is designed to prevent “gross injustice.” In the eyes of the justices (or at least in their questions), gross injustice seems to suggest something more serious than these more mundane factors. Although both parties and the US Government agree that the “exceptional case” standard should follow a gross injustice standard, Justice Scalia offered a predictable negative outlook on that standard since its establishment is largely based upon legislative history. Ordinarily, the Supreme Court gives no deference to appellate court decisions. However, here Chief Justice Roberts jumped into the debate to consider the role of deference to the appellate panel in this case based upon the congressionally mandated role of the Federal Circuit in unifying patent law. CHIEF JUSTICE ROBERTS: [W]hy shouldn’t we give some deference to the decision of the Court that was set up to develop patent law in a uniform way? They have a much better idea than we do about the consequences of these fee awards in particular cases. And since we’re just as Justice Kennedy pointed out dealing with adjectives, you know meritless, frivolous, exceptional why don’t give some deference to their judgment? MR. TELSCHER: Well, I think we need to look at the basis of the judgment. MR. MARTINEZ: I think if the Federal Circuit had had a consistent view over its history or if the Federal Circuit were not internally divided on this issue, that may be a consideration. Deference might be more appropriate. But here there is no consistent history and the Federal Circuit, as we’ve seen in Kilopass, is divided. Here, Chief Justice Roberts may be considering whether the Federal Circuit should be thought of more like an expert agency who would receive some amount of deference for its rulemaking (i.e., precedential decisions). In the oral arguments, Justice Alito attempted to focus in on exceptionality and noted that, for most district court judges, all patent cases are unusual and – as such – may have no basis for determining whether a particular case is exceptional as compared with the ordinary patent case. An important issue in the Octane fitness case that was only subtly discussed is also whether clear-and-convincing evidence is required to prove an exceptional case or is a preponderance of the evidence sufficient. Carter Phillips argued on behalf of the respondent here; arguing that – absent other misconduct – that the case must have been “objectively baseless” in order to be deemed exceptional under Section 285. One interesting aspect of the decision focused on the applicability of the Supreme Court’s decision in Prof’l Real Estate Investors v. Columbia Pictures Indus.,508 U.S. 49 (1993) and Noerr immunity. CHIEF JUSTICE ROBERTS: First Amendment concern, what, to bring a patent case? MR. PHILLIPS: Well, access to the courts, access to the courts. Any time you talk about imposing multimillion dollar fee awards at the end of the litigation, particularly if you do it on a fairly arbitrary basis. JUSTICE SCALIA: Do you think Congress could not require the loser to pay in all cases? MR. PHILLIPS: Well, I have no doubt that Congress could well, I’m not sure about in all cases. JUSTICE SCALIA: I mean, if it can do that, there’s certainly no First Amendment problem. JUSTICE SCALIA: That’s an English rule. It used to be our rule. I don’t see how you can possibly say that it’s unconstitutional to make the loser pay. MR. PHILLIPS: It is not my best argument, I appreciate that. When Justice Breyer entered the argument, he implicitly pushed Mr. Phillips to recognize that the USPTO has issued many bad patents but that the associated presumption of validity of the patents is a setup that makes it very hard to show a case is objectively baseless even when it is pretty clear that a patent is invalid. Philips responded simply that the filing of a frivolous claim should be seen as objectively baseless and that the present case was not such a case. MR. PHILLIPS: First of all, as I say, the plaintiff this you know, there’s a reason why you don’t see advertisements on television when Saiontz & Kirk says, If you think your patent has been infringed, call us. Why? Because there’s not a long line of people who can bring plaintiffs’ patent cases. They are expensive to litigate, and the ultimate effect and you have to get an expert, and at the end, you put your patent into validity [risk]. Apart from that, however, the court did not appear to focus on the “troll” issue in any depth. The Highmark argument came immediately following that of Octane Fitness. The second cases focuses on the standard of appellate review for the objectively baseless question and so, obviously depends upon the outcome in Octane Fitness. Certainly, if the court moves toward a “totality of the circumstances test” then more deference would be given to district court judges in their determination. That makes Highmark the trailing decision here and likely less important. The request for oral arguments is denied. Micron’s position is meritless, and I am surprised that micron’s distinguished Delaware counsel did not talk lead counsel out of its opposition to the motion. [Order Lifting Stay]. Semcon’s case against Micron involves the chemical-mechanical polishing and planarization used in semiconductor wafer manufacturing. U.S. Patent No. 7,156,717. Earlier in the litigation, the parties in the action agreed to a stay of the litigation pending outcome of parallel cases involving the same patent against Applied Materials. In December 2013 that case was voluntarily dismissed as part of a settlement agreement between Semcon and Applied Materials. Semcon then repeatedly sought to meet and confer with Micron’s opposing counsel from Weil Gotshal regarding re-opening of the case, and then eventually filed a motion to lift the stay. Of course, the court saw Micron’s argument as too clever and has ordered the case reopened. I suspect that Semcon will next move for some amount of Rule 11 fees. Micron has an interesting reputation in the patent sphere. In 2011, the company stopped hiring University of Illinois engineers because the university had sued Micron for patent infringement. The company also has an (apparently) ongoing back-end deal with Round Rock to enforce more than 1,000 of its patents. A few days ago, I wrote about defendants behaving badly and whether there are clear examples of that occurring. Although admittedly biased, patent plaintiff IP Nav (Erich Spangenberg) has an put together an interesting essay on the topic of fee shifting. See Patent Lawsuit Defendants Behaving Badly. The essay explains why IP Nav can be happy with a fee shifting rule – as long as it is balanced so that he can collect fees against defendants who engage in willful infringement, make meritless arguments in court, and needlessly drag-out litigation. The essay also highlights a few examples such as Takeda Chemical v. Mylan Laboratories (attorney fee award of $16.8 million to the patentee Takeda because Mylan’s obviousness argument was “so devoid of merit and so completely fail[ed] to establish a prima facie case of invalidity that it must be described as `baseless. '”) and Beckman Instruments, Inc. V. Lkb Produkter Ab. (Attorney fees for the patentee Beckman for defendant’s vexatious litigation). On Wednesday of this week, the Supreme Court will be hearing oral arguments in the two pending fee shifting cases Highmark and Octane Fitness. In a 2012 decision, the district court ruled that Sidense did not infringe any of the claims of Kilopass’s three asserted memory-cell patents and that decision was affirmed on appeal (without opinion). However, the district court denied an exceptional-case attorney-fee award because Sidense had failed to provide clear and convincing evidence that the infringement action was brought or prosecuted in bad faith. In a decision calling for broader awards of exceptional-case attorney-fees, the Federal Circuit has vacated and remanded. Judge O’Malley penned court’s opinion with a concurring opinion filed by Chief Judge Rader. 35 U.S.C. § 285 provides that “[t]he court in exceptional cases may award reasonable attorney fees to the prevailing party.” Over the past several years, Exceptional-case awards have been few-and-far-between and the perception is that those awards are particularly rare for prevailing defendants who successfully avoid liability for infringement. In Brooks Furniture, the Federal Circuit ruled that a prevailing accused infringer can receive fees under Section 285 based upon either (1) objectively baseless litigation brought in subject bad faith or (2) other misconduct during the litigation. The attorney-fee issue is hot right now. The Supreme Court will hear two pending cases on the interpretation of Section 285 later this term and Congress is considering several bills that would make it easier for a prevailing party to also get its fees paid-for. These actions are primarily focuses ways to push-back against patentees who raise unsuccessful infringement claims. A case can still be brought in bad faith even if the plaintiff-patentee did not have actual knowledge of its baselessness. Rather, the knowledge requirement can be met when a lack of objective foundation for a claim was either known or obvious. Thus, a plaintiff with a misguided belief in its case can still be found to have brought the case in bad faith if the baselessness of the claim would have been obvious to someone more reasonable. A “smoking gun” that reveals “that a patentee knew that he had no chance of winning a lawsuit” is sufficient to show subjective bad faith despite other evidence to the contrary (such as an opinion of counsel that the case is a good one). Judge O’Malley also discussed, but rejected, the defendant’s arguments that (1) subjective bad faith be eliminated as an element of an exceptional case finding and that (2) fees should be awarded in cases where a patentee loses a week but reasonable case. In light of patentees’ First Amendment right to petition the government (by, for instance, filing a lawsuit seeking relief in the courts), we do not think Congress intended to discourage patentees from bringing reasonable claims of infringement by raising the specter of fee shifting—even when the patentee’s legitimate claims are on less than the firmest ground. Instead, when a plaintiff presses reasonable, but weak, claims of infringement, a prevailing defendant must look to the many other bases for fee shifting under § 285. Writing in concurrence, Chief Judge Rader argued that the rule for fee-shifting should be more liberal and generally allowed whenever the circumstances require fee shifting in order to prevent a gross injustice. See Eltech Sys. Corp. v. PPG Indus., Inc., 903 F.2d 805 (Fed. Cir. 1990). What is an Exceptional Case such that Court Should Award Attorney Fees? Highmark Inc. v. Allcare Health Management Sys., Docket No. 121163. Both cases stem from the same perspective that the “exceptional case” requirement for attorney fees is too narrowly construed by the courts and especially by the Federal Circuit. See 35 U.S.C. § 285. It is not contemplated that the recovery of attorney’s fees will become an ordinary thing in patent suits, but the discretion given the court in this respect, in addition to the present discretion to award triple damages, will discourage infringement of a patent by anyone thinking that all he would be required to pay if he loses the suit would be a royalty. The provision is also made general so as to enable the court to prevent a gross injustice to an alleged infringer. S. Rep. No. 1503, 79th Cong., 2d Sess. (1946), reprinted in 1946 U.S. Code Cong. Serv. 1386, 1387. In several cases, the Federal Circuit has considered the standard and, after some debate, decided in Eltech Systems Corp. v. PPG Industries, Inc., 903 F.2d 805 (Fed. Cir. 1990), that the exceptional case standard should be the same for both prevailing plaintiffs and for prevailing defendants – writing: “we now reach the question and determine that there is and should be no difference in the standards applicable to patentees and infringers who engage in bad faith litigation.” The Eltech Systems case was then cited positively by the Supreme Court in Fogerty v. Fantasy, 510 U.S. 517 (1994) as justification for a party-neutral approach to fee shifting in copyright cases. We note that the federal fee-shifting statutes in the patent and trademark fields, which are more closely related to that of copyright, support a party-neutral approach. Those statutes contain language similar to that of [17 U.S.C.] § 505, with the added proviso that fees are only to be awarded in “exceptional cases.” 35 U.S.C. § 285 (patent) (“The court in exceptional cases may award reasonable attorney fees to the prevailing party”); 15 U.S.C. § 1117 (trademark) (same). Consistent with the party-neutral language, courts have generally awarded attorney’s fees in an evenhanded manner based on the same criteria. For patent, see, e.g., Eltech Systems Corp. v. PPG Industries, Inc., 903 F.2d 805, 811 (Fed. Cir. 1990) (“[T]here is and should be no difference in the standards applicable to patentees and infringers who engage in bad faith litigation”). For trademark, see, e.g., Motown Productions, Inc. v. Cacomm, Inc., 849 F.2d 781, 786 (2nd Cir. 1988) (exceptional circumstances include cases in which losing party prosecuted or defended action in bad faith); but see Scotch Whisky Assn. v. Majestic Distilling Co., 958 F.2d 594 (4th Cir.) (finding in the legislative history that prevailing defendants are to be treated more favorably than prevailing plaintiffs), cert. denied, 506 U.S. 862 (1992). Of course, the problem with a party-neutral approach is that it can only be applied at a certain high level of granularity or abstractness. Since patentees and accused infringers make systematically different argument and have systematically different strategies, the particular causes of exceptional case findings tends to be different. Thus, losing infringers most often pay fees based upon ongoing willful and reckless infringement while losing patentees most often pay fees for suing on patent obtained through inequitable conduct or for bringing baseless lawsuits. At that low level of granularity, the differences are such that it is difficult to compare whether a party-neutral approach is being applied. Thanks to John Pinkerton at Thompson & Knight for providing me with this legislative history from the 1946 Act. Post-grant patent maintenance fees offer an easy mechanism for shifting patentee behavior. In the US, patent holders must pay a maintenance fee three times during the life of an issued patent. I think of the fee as akin to property tax. When a real-property owner fails to pay the property taxes, the state forecloses. In the patent system failure to pay the maintenance fees similarly results in the property right be taken from the non-payer. However, instead of reselling the patent at auction, the government instead announces that the previously patented invention is no longer protected by any exclusive right, i.e., that the patent right has been abandoned. Patent rights are usually thought of as normal goods in that a higher price typically leads to a lower quantity demanded. In the maintenance fee context, higher maintenance fees lead to more patents being abandoned. And, most patents go abandoned by the time that the third-maintenance fee rolls around because patent holders decide that the extra payment is not worth the extra money. It is proposed that patent maintenance fees be increased according to a sliding scale tied to the number of non-practiced patents a patent owner has in its portfolio. Thus, as the size of a firm’s patent portfolio increases, so too does the maintenance fee multiplier charged for all its patents, beginning with the second maintenance fee due date. All patents with common ownership interests would be aggregated in determining the fee enhancement. Because the enhanced fees do not kick in until 7.5 years after issuance, incentives to invent and to disseminate should not be significantly reduced. This proposal will encourage large patent portfolio holders to pare down their holdings by determining which of their older patents are not worth maintaining. This will benefit competitors and new inventors who are currently subject to hold-up problems from large portfolios — many of which are particularly caused by old, low-value patents held en masse. [Read the article here: http://ssrn.com/abstract=2318521]. Olson’s approach is essentially a weak version of a “working requirement” seen in some countries that makes a patent unenforceable unless it is being used by the patentee. Instead of requiring working, Olson provides a monetary incentive. Although Olson’s article is focused on the problem of “trolls,” his proposal would have its greatest impact on large technology companies such as IBM, Samsung, Intel, and others whose patent porfolios include large numbers of patents that are not being practiced. Those companies are already “suffering” from major increases in maintenance fees implemented by the USPTO earlier in 2013. Monolithic Power Systems (MPS) v. O2 Micro (Fed. Cir. 2013). More than a decade ago, the Beckman Instruments court foretold, "we can certainly imagine a case in which litigation misconduct would justify an award of attorney fees for the entire litigation." Beckman Instruments, Inc. v. LBK Produkter AB, 892 F.2d 1547 (Fed. Cir. 1989). We are quite confident that this was the kind of case it had in mind. Background: In October 2008, MPS filed a declaratory judgment (DJ) action against O2 Micro – asking the district court to issue declarations of noninfringement and invalidity with respect to four O2 Micro patents. U.S. Patent Nos. 6,856,519, 6,809,938, 6,900,993, and 7,120,035. O2 Micro's attorneys had been monitoring case-filing information and, when the company learned that it had been sued, it quickly filed its own complaint regarding the same patents in the USITC (even before MPS was able to serve notice on O2 Micro). O2 Micro then filed a motion to stay the district court. 28 U.S.C. § 1659 provides statutory guidance for staying district court patent litigation while awaiting the outcome of USITC actions. The statute states that when there are parallel proceedings, "the district court shall stay, until the determination of the Commission becomes final, proceedings in the civil action with respect to any claim that involves the same issues [being adjudged at the USITC]. The stay provision has two additional requirements. First, the stay must be requested by one of the parties. Second, as a deadline, the request to stay must be made within either "(1) 30 days after the party is named as a respondent in the proceeding before the Commission, or (2) 30 days after the district court action is filed, whichever is later." 28 U.S.C. § 1659. However O2 Micro apparently waited a bit beyond the 30-day deadline which gave the district court discretion to deny the stay motion. Losing Case and Covenants Not To Sue: As the litigation progressed, O2 initially provided evidence of a February 1998 invention date based upon the inventor's testimony and an electronic date-stamp on the documents. However, MPS provided evidence that the date-stamp had been back-dated. The district court sided with MPS in ruling that the earliest invention date was July 1999. And, subsequently, the court-appointed technical expert (Prof. Perreault) drafted a memo that the patents were invalid based upon intervening prior art. Before the court could issue its final judgment (likely placing official approval on the expert report) O2 issued a unilateral covenant-not-to-sue that forced dismissal of the lawsuit. O2 had previously issued covenants not to sue in a handful of other cases once the cases began going south. Full Attorney Fees Awarded: Although the court was unable to make its final invalidity ruling, it did take a major step by awarding MPS its entire attorney fees and costs of $9,000,000+. The patent statute provides for fee-shifting in "exceptional cases." 35 U.S.C. § 285 ("The court in exceptional cases may award reasonable attorney fees to the prevailing party.") The award here was based upon O2's "vexatious litigation strategy, litigation misconduct and unprofessional behavior." To be clear, the problem, according to the Judge, was not just this case, but instead the pattern of bad behavior seen in prior cases as well. On appeal, the Federal Circuit has affirmed and repeated its earlier statements that "litigation misconduct" alone can be sufficient to make a case exceptional under § 285 – even when the lawsuit itself is not objectively baseless or brought in bad faith. "In other words, litigation misconduct alone may suffice to make a case exceptional." Pattern from Prior Cases: The Federal Circuit also affirmed that the exceptional case award can be based on a pattern of "vexatious litigation strategy" that extends beyond the particular case or controversy at issue. [T]he district court's findings of an overall vexatious litigation strategy and numerous instances of litigation misconduct are sufficient to support an exceptional case determination. The record provides ample grounds for the district court to find that O2 Micro had undertaken a vexatious litigation strategy. Having presided over a decade of litigation between O2 Micro and MPS, the district court witnessed several instances in which O2 Micro sued MPS customers in order to prompt MPS to file declaratory judgment actions with the court. In each previous case, O2 Micro withdrew its claims and granted covenants not to sue after substantial litigation had taken place. In the underlying case, O2 Micro employed its modus operandi, this time moving to dismiss only after MPS and ASUSTeK had completed their filings for the final pretrial conference, wasting the parties' and the court's resources. The district court, with its unparalleled familiarity with and insight into O2 Micro's motivations and repeated resort to these tactics, assessed that this pattern amounted to a vexatious litigation strategy that would support a finding of exceptional case. We decline to disturb that assessment. Now, to be clear, while the prior pattern is relevant to the exceptional case award, the court did not here indicate that the costs of the prior cases could be tacked-on. Based on the examples of unprofessional behavior provided by the district court and the many more instances of it we were able to glean from the record, we agree with the district court that O2 Micro's rampant misconduct so severely affected every stage of the litigation that a full award of attorney fees was proper here. Under the unique circumstances, the district court's award of ITC-related expenses is also not an abuse of discretion, especially in view of the discovery's application in the district court and the parties' agreement to its dual use. $9,000,000 pre-trial. It is somewhat amazing that the attorney fees and costs awarded here were $9 million even though no trial occurred. That amount represents a 10% reduction on some fees and a 25% reduction on other fees. $300,000 of that amount went toward calculating the fees! ("Fees generated in preparing attorneys' fees application, $ 343,035). In order to appeal, a losing party who owes some monetary judgment will normally be required to post an appeal bond. FRCP 62(d). Here, O2 has already put-up $9.5 million in order to cover the amount due plus interest. Following claim construction, the district court ruled on summary judgment that Octane’s elliptical machines did not infringe Icon’s U.S. Patent No. 6,019,710. However, the district court refused to find the case “exceptional” under 35 U.S.C. § 285. Under the statute, a “court in exceptional cases may award reasonable attorney fees to the prevailing party.” And, without that exceptional case ruling, the defendant had no opportunity to recoup the money spent defending the case. The determination of whether a case is exceptional and, thus, eligible for an award of attorney fees under § 285 is a two-step process. First, the district court must determine whether a case is exceptional, a factual determination reviewed for clear error. After determining that a case is exceptional, the district court must determine whether attorney fees are appropriate, a determination that we review for an abuse of discretion. A district court abuses its discretion when its decision is based on clearly erroneous findings of fact, is based on erroneous interpretations of the law, or is clearly unreasonable, arbitrary or fanciful. Cybor Corp. v. FAS Techs., Inc., 138 F.3d 1448 (Fed.Cir.1998) (en banc) (citations omitted). This process is akin to that used for enhanced damages where the court first considers whether the infringement was willful and then determines the scope of damage enhancement (if any). One key difference is that Section 285 provides the “exceptional” standard while the “willful infringement” requirement for enhanced damages was created by the court without any statutory key. We call this the “American rule” of fee shifting because there is an alternate “British rule” that regularly awards fees to the prevailing party regardless of exceptionality of the case. Of most interest, Octane requested that the court revisit (i.e., lower) the standard for determining whether a case is exceptional. As it must, the panel here rejected that request because it is bound by prior Federal Circuit precedent. However, an en banc request on this point may garner some traction with the court. Traditionally, there has been something of a bias relatively in favor of exceptional case findings for prevailing plaintiffs but not for prevailing defendants. The bias comes about because a prevailing plaintiff can typically include out-of-court activities such as willful infringement as part of its proof of exceptional case while a prevailing defendant can typically only prove an exceptional case based upon a patent plaintiffs activities during litigation or when securing patent rights. Patent litigation is expensive. According to a survey published in 2009 by the American Intellectual Property Law Association (“AIPLA”) the median cost for a patent litigation in which the amount in controversy is from $1-25 million, through the end of discovery, is $2.5 million (inclusive of all costs). Unscrupulous large companies know this, and, unfortunately, can use patent litigation as a weapon against competitors, especially smaller competitors. Many smaller competitors simply do not have the financial resources or wherewithal to defend a patent infringement case, no matter how spurious the contentions. Judge Story once wrote that patent litigation is the “sport of kings.” Larger companies can exploit this fact to the detriment of their smaller competitors. Complicating matters, there is almost no economical or expeditious way for an accused infringer to extract itself from baseless litigation. Unlike certain forms of litigation ( e.g., securities litigation or antitrust litigation) rarely is a patent infringement action dismissed at the pleading stage. Rather, before a defendant accused of infringement has any hope of extricating itself from a litigation, often-times (as here) substantial discovery (both fact and expert), Markman briefing and hearing, and summary judgment briefing and hearing, must occur. By the time summary judgment is granted, substantial time is invested in the case not only by the parties, but by the district court, as well. For their part, district court judges–who, in many instances, have no technical background and little familiarity with the patent system–are often faced with complex technology, difficult-to-read patent language and a body of case law that is both robust and nuanced. No matter how preposterous the merits of the infringement position may be, in order to reach a resolution on the merits, the district court judge must invest significant time and energy, to decipher the claim scope and understand the defendant’s position. For these reasons, no matter how unreasonable the patentee’s contentions, it is a rare district court judge who will have the courage to call a patentee’s claims “frivolous” after the investment of time and effort necessitated by these cases. For these reasons, and because of the inconsistent application of the “exceptional case” findings by district courts, Octane proposes that in the context of a prevailing accused-infringer, the legal standard for exceptional case should be re-evaluated. Octane respectfully proposes that a case should be deemed “exceptional” if the infringement claims asserted by the patentee were objectively unreasonable. If they were objectively unreasonable (as here), then the case should be deemed exceptional, and, unless equitable considerations counsel otherwise in the context of the particular case, fees awarded. Octane’s rationale for this proposal are set forth below, as well as factors this Court might articulate to better assist district courts in identifying objectively unreasonable cases. 1. The Rationale for Fee Shifting Where a Patentee Asserts an Objectively Unreasonable Claim of Infringement Against a Competitor. Title 35 of the United States Code, § 285 authorizes such scrutiny in the context of infringement litigation and specifically authorizes an award of attorney fees in “exceptional” cases. But what is an “exceptional” case? This Court has endeavored to provide guidance to district courts as to the meaning of an “exceptional” case. This Court has indicated that fees are properly awarded in a variety of contexts, including “vexatious or unjustified litigation” or “frivolous filings.” See, e.g., Takeda, 549 F.3d at 1388; Eon-Net LP, 653 F.3d at 1324; Waner v. Ford Motor Co., 331 F.3d 851, 857 (Fed. Cir. 2003); Bayer AG v. Duphar Int’l Research B.V., 738 F.2d 1237, 1242 (Fed. Cir. 1984). However, this Court has also indicated that absent litigation misconduct or fraud in securing a patent, a district court can award attorney fees only if the litigation is both: (1) brought in subjective bad faith and (2) objectively baseless. See, e.g., Eon-Net LP, 653 F.3d at 1324. These differing statements of the standard and other factors noted below, have led to inconsistent application of the exceptional case designation by district courts, particularly in the case of a prevailing alleged infringer. Octane respectfully submits that commencement and maintenance of objectively unreasonable infringement contentions should be sufficient, standing alone, to deem a case exceptional. This standard is, in many ways, consistent with this Court’s cases holding that unjustified or frivolous suits may be deemed “exceptional.” Octane, however, advocates for reconsideration of the case precedent that indicates litigation misconduct or subjective bad faith should be required – in addition to baseless contentions – before finding a case exceptional. Additionally, Octane proposes use of the words “objectively unreasonable” rather than “frivolous” or “baseless.” As explained in more detail below, the words “frivolous” or “baseless” often imply misconduct by counsel, and perhaps even violation of Rule 11. Octane respectfully suggests that an action should not have to rise to the level of a Rule 11 violation, before a case could be deemed exceptional; else the remedies are duplicative. Rather, patentees (including non-practicing patentees) asserting their legal monopoly should at least have to assert objectively reasonable causes of action, or else the risk of paying for the litigation should shift to the patentee, regardless of counsel’s conduct. This is fair and consistent with the overarching goals of the patent system. The alternative–leaving patentees unchecked to assert thin-beyond-reason causes of action–has a huge anticompetitive impact on society and constitutes a gross injustice to innocent defendants. As any defendant accused of patent infringement could attest, the mere existence of litigation typically has a detrimental impact on business, as customers become nervous about buying a product accused of infringement. This translates into higher costs for end customers as the patentee is able to prevent competition (often legitimate competition) and maintain monopoly prices. Meanwhile, the only recourse for a wrongfully accused infringer, apart from recouping fees under the present standard, is to bring a separate tort cause of action after conclusion of the Federal patent case in state court (which has even less experience with patent law than most district courts), or advance a cost-prohibitive antitrust action, if market share and other elements can be established. For these reasons, district courts need to know that they can find a case exceptional when a patentee fails to assert its legal monopoly responsibly and asserts and maintains objectively unreasonable causes of action. Considerations a district court might consider when evaluating whether the patentee’s contentions were objectively unreasonable include: (1) more than one claim element was missing in the accused device, (2) the case was resolved on summary judgment, (3) the patentee was not practicing the claimed invention, (4) the patentee’s claim of infringement was based on a claim construction position that: (a) contradicted the prosecution history, or (b) read a limitation out of the claim entirely, or (c) was not rationally related to what was actually invented, (5) the patentee ignored or reargued the court’s claims construction, (6) the accused device incorporated technology that pre-dated the asserted patent, in lieu of the technology disclosed in the patent-in-suit, and (7) the accused infringer communicated to the patentee near the start of the case an alleged design around or element(s) not present in the accused product; the patentee proceeds forward unreasonably; and the defendant ultimately prevails on that issue. Octane submits that the above factors are examples of factors a district court may consider when determining if a case was objectively unreasonable. These factors encourage early candid discussions between the parties and potentially fosters early settlement, which has been recognized as a laudable goal of the judicial system. Foster v. Hallco Mfg. Co., Inc., 947 F.2d 469, 477 (Fed. Cir. 1991). Moreover, the standard appropriately shifts the risk of fees to a patentee that proceeds forward with weak claims having no reasonable chance of success. Accused infringers should not have to bear the heavy cost of patent litigation where patent owners proceed forward with no more than a scintilla of hope or a desire that the accused infringer will collapse when confronted with a weak claim. To be clear Octane is not proposing that “exceptional case” means any case in which an alleged infringer prevails. But cases that are objectively unreasonable should be “exceptional”, and not the norm. The cost of spurious infringement claims should be borne by the patentee, not the alleged infringer trying to compete fairly in the marketplace. In those instances (instances which would be even less frequent under this standard than at present), fee shifting is appropriate. 2. Exceptional Case Status Should Not Require Proof of a Rule 11 Violation. By calling for a standard that allows for the award of fees in “objectively unreasonable” cases Octane is not necessarily arguing for a departure from the line of cases that would allow an award of fees in “frivolous” or “baseless” cases. However, Octane is proposing that the “exceptional” case standard of 35 U.S.C. § 285 should not be commensurate with a Rule 11 violation. To begin, Rule 11 already includes provisions for sanctions, which would render Section 285 unnecessary if they require proof of the same conduct. Fed. R. Civ. P. 11. Beyond this, labeling a case “frivolous” such that it constitutes a violation of Rule 11 is not a step that most courts take lightly, not only because of the time and money investment in these cases, but also because labeling a case “frivolous” such that it constitutes a violation of Rule 11 requires condemnation of litigation counsel’s conduct. Rule 11 provides, among other things, that by signing all materials submitted to the Court an attorney is representing that “the claims, defenses, and other legal contentions are warranted by existing law or by a non-frivolous argument for extending, modifying, or reversing existing law or for establishing new law. . .” If a case is “frivolous” under Rule 11, then a patentee’s counsel must have acted inappropriately, a conclusion that most courts are loathe to reach. 3. Exceptional Case Status Should Not Require Litigation Misconduct Apart from Asserting an Objectively Unreasonable Claim. Asserting an objectively unreasonable claim is a form of litigation misconduct. Nevertheless, no separate requirement for litigation misconduct should be necessary to establish an exceptional case. A patentee that pursues an objectively unreasonable claim but otherwise responds to discovery in a timely manner, does not destroy relevant documents, shows up to depositions, etc… should still bear the cost of its competitor’s fees, when the unreasonably maintained cause of action fails. No additional litigation misconduct should be necessary. Moreover, the Federal Rules provide for sanctions for specific litigation misconduct as it occurs. See e.g., Fed. R. Civ. P. 26(g)(3) (authorizing sanctions for improper certification of disclosures and discovery responses); Fed. R. Civ. P. 30 (providing for sanctions for failure to attend a deposition); Fed. R. Civ. P. 37 (authorizing motions and sanctions if a party fails to respond or make appropriate disclosure to discovery requests); see also 28 U.S.C. § 1927 (“any attorney. . . who so multiplies the proceedings in any case unreasonably and vexatiously may be required by the court to satisfy personally the excess costs, expenses, and attorneys’ fees reasonably incurred because of such conduct”). To the extent a patentee (or its counsel) takes some action in litigation that is wrongful, drives up costs, or otherwise violates litigation rules, then the alleged-infringer may bring that conduct to the district court’s attention at the appropriate time, and the district court should order appropriate sanctions, including fines. Encouraging district courts to deal with litigation misconduct in this manner, promotes professionalism and civility and better addresses the specific issues in a timely manner. Though litigation misconduct could, of course, also be a factor in deeming a case “exceptional”, Octane propose that it should not be a requirement for finding a case exceptional in the face of objectively unreasonable claims. 4. Exceptional Case Status Should Not Require Proof of Bad Faith. In a patent case, the most an accused infringer can ever hope for is recoupment of attorney’s fees and costs. Even in the rare cases where this is awarded, however, the accused infringer is not made whole. That party is still out the hundreds of hours dedicated by company personnel to the defense of the case (hours that could have been spent on research and development, sales efforts and other endeavors), not to mention the often-significant cost that the suit may have had on the accused infringer in the marketplace. Unlike on the patentee side, where the plaintiff may get treble damages against a willful infringer, the wrongfully-accused infringer has no such remedy against a patentee. The accused infringer is entitled to, at most, recoupment of reasonable fees. Regardless of intent (which is inevitably almost impossible to prove), a patentee that asserts an objectively unreasonable cause of action against its competitor should bear the risk of paying that competitors fees if it is unsuccessful. This is an interesting problem. At the end of the case, a prevailing party has generally proven that the losing party’s case is without merit (i.e., it lost). In that sense, at the end of the case, the position is subjectively, reasonably, and objectively baseless. The question is, however, at the beginning of the case (and to some extent throughout the case) did the position have some merit? At first cut the proposed fee shifting appears to be a good mechanism for shifting risk onto plaintiffs who, in turn, will avoid filing baseless claims. A benefit of the current rule (objectively baseless) is that it is fairly clear and so the self-weeding is easy. Octane’s multi-factor proposal makes this a much more difficult if not impossible task – meaning that the new rule would also end up discouraging some amount of valid patent claims. Octane is represented by Rudy Telscher and Kara Fussner of Harness Dickey’s St. Louis office. Larry Laycock and his team at Workman Nydegger in Salt Lake represent Iconn. There is a good chance that Octane won’t push this case any further since it won the underlying decision (non-infringement) and that decision was affirmed on appeal. My report to Congress last week included a statement regarding the greatest change at the USPTO since the September 16, 2011: Funding. After raising fees and receiving permission to spend fees collected, the USPTO began to quickly implement a plan to address the backlog of patent applications awaiting examination and to address particular bottlenecks in the system such as the 25,000+ queue awaiting action from the Board of Patent Appeals. Under the AIA, the USPTO has authority to set fees within certain limits. In a recent document, the Office has published a proposed patent fee schedule and will hold a hearing at the USPTO’s campus on February 15 and in Silicon Valley on February 24. (Note, the USPTO has also published a set of proposed rules to implement post-grant reforms. I will discuss those in a separate post). The bottom line for fees is that that they are on the rise. Filing+Search+Examination Fee rising to $1,840 from $1,250. Excess Independent Claims rising to $460 each (after 3) from $210. Excess Total Claims rising to $100 each (after 20) from $60. Request for Continued Examination rising to $1,700 from $930. Notice of Appeal rising from $930 to $1,700 but issue fee is waived if Examiner withdraws rejection. Nothing more will be due at the appeal brief stage. However, once the examiner’s answer is received, applicant will need to pay $2,500 to move forward with the appeal. Three-Stage Maintenance Fees from $8,710 to $12,800. The one fee being reduced is for publication+issue – dropping from $2,040 to $960. For a certain class of patent applicants, the new fee structure will not be a problem – so called “micro entities” will receive a 75% discount. The general definition of micro entities limits the scope of that class to individuals and very small companies with little patenting experience. The biggest winners in the AIA process have been universities. In the fee scenario, universities successfully lobbied to be classified as micro entities. (UC’s budget for 2011 was $22 billion…). The independent inventor J. Carl Cooper invented and patented technology separating a sync signal from a video signal to better ensure vertical and horizontal hold on a video screen. Cooper assigned his rights to TLC which sued Videotek for infringement. Videotek pulled-in its supplier Gennum for indemnification. Gennum now remains as the only defendant. Priority Date: Cooper’s asserted patent claims priority to an earlier application filed in 1992. The district court found specifically that claim 33 could not claim priority all the way back because the claim included a limitation to an “other circuit” which was only disclosed in the subsequent continuation. Burdens of Proof and Production: Although a defendant ultimately bears the burden of proving invalidity, the burden of producing evidence may shift back and forth during litigation. For instance, once a defendant provides evidence of anticipation, the patentee then has the “burden of going forward with evidence either that the prior art does not actually anticipate, or … that it is not prior art because the asserted claim is entitled to the benefit of a filing date prior to the alleged prior art.” Proving priority requires evidence of the priority claim and also evidence showing that “the written description in the earlier application supports the claim.” Here, the court required cooper to produce “sufficient evidence and argument to show that [the priority document] contains a written description that supports all the limitations of claim 33, the claim being asserted.” Once the evidence is on the table, the claim will only be invalid if the defendant’s proof remains is clear and convincing. [B]ecause an issued patent is by statute presumed valid, a challenger has the burden of persuasion to show by clear and convincing evidence that the contrary is true. That ultimate burden never shifts, however much the burden of going forward may jump from one party to another as the issues in the case are raised and developed. Here, the Federal Circuit agreed that the defendants had clearly proven that the original written description was insufficient – and thus that the patentee could not claim priority all the way back. This is not to say that the determinations made by the corps of examiners are not important, or should not be worthy of appropriate deference to their expertise in these technical matters, especially when we have the benefit of well-reasoned explications. It is to say that when dealing with the intangible worth to be accorded an administrative agency’s decision making, the judicial process cannot be held hostage to the timing of either the agency or the litigants who have invoked the agency’s further review. In some circumstances a party may be able to obtain a stay from the trial court while awaiting the sought-for agency action; absent that, and absent extenuating circumstances not here present, the case must be decided on the record the litigants present for appeal. There has never been an exception [requiring submission of] anticipatory cumulative references, and we are not inclined to create one now. Definiteness of Means Plus Function Claim: A MPF claim must be supported by structural disclosure found in the patent specification – this requirement is akin to the written description requirement and focuses on actual disclosure rather than enablement. The question is not whether one of skill in the art would be capable of implementing a structure to perform the function, but whether that person would understand the written description itself to disclose such a structure. In electronic circuit cases the actual circuit disclosures are not necessarily required. Rather, generic “core logic” may be sufficient. Here, the defendants were unable to provide clear and convincing evidence of a lack of structure. (1) supporting a requirement that a court award attorney fees to the winning party in most patent cases; [fees “shall” be awarded unless the losing position was “substantially justified”or if the award would be unjust because of special circumstances]. (3) opposing any right for an interlocutory appeal from claim construction decisions in patent litigation.